Guiding children through the grieving process can be difficult. For kids who have lost a loved one, the Langley Hospice Society has now created a new fun, safe space to visit. 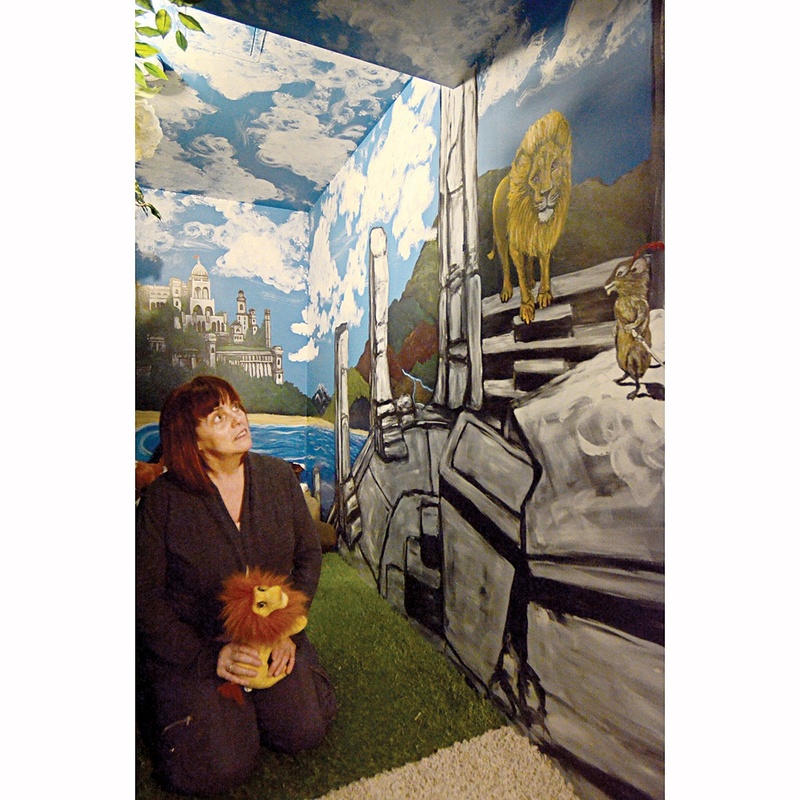 The Narnia room in the Hospiceâ€™s Langley City building is covered with murals based on the C.S. Lewis novels. The seven classic childrenâ€™s fantasies all involve children from our world who are whisked away into a land of magic, adventure, and talking animals. The room was created based on the spontaneous play of a number of children, said Lynda Sheridan, child and youth bereavement coordinator. The room was a simple, unfinished closet with a small, wardrobe-like door off the kitchen of the Supportive Program Centre in Langley City. Kids playing there dubbed it the entrance to Narnia one day, said Sheridan. After the second group of children decided the same thing, Sheridan and other staff decided to make it a reality. This year, a practicum student helped get a grant from Langley Township. With designs by Alyx Essers and Tess Nickel of Kwantlen Polytechnicâ€™s fine arts department, the last few weeks were spent painting scenes from Narnia on the walls and ceiling. Itâ€™s meant to be a safe space for children, where they can be read stories, or let off steam by tossing around pillows. â€œItâ€™s just a magical, comfortable space for them to be in,â€ Sheridan said. Playing is a part of many of the youth programs at Langley Hospice. â€œPlay is a part of who they are and how they express themselves,â€ said Sheridan. The painting was finished the Friday before the Hospiceâ€™s garden party last week, allowing visitors to check it out in its finished form. But the children coming to Hospice have been getting sneak peeks. â€œThe children have been here watching the painting happen,â€ Sheridan said. For this yearâ€™s Hospice-organized summer camp, Camp Chrysalis, the Narnia theme will carry over. Sheridan was making shields, and there will be a â€œroyal paradeâ€ at the camp, among other activities, she said. The public will be able to see the room during this fallâ€™s planned open house at the Supportive Program Centre.